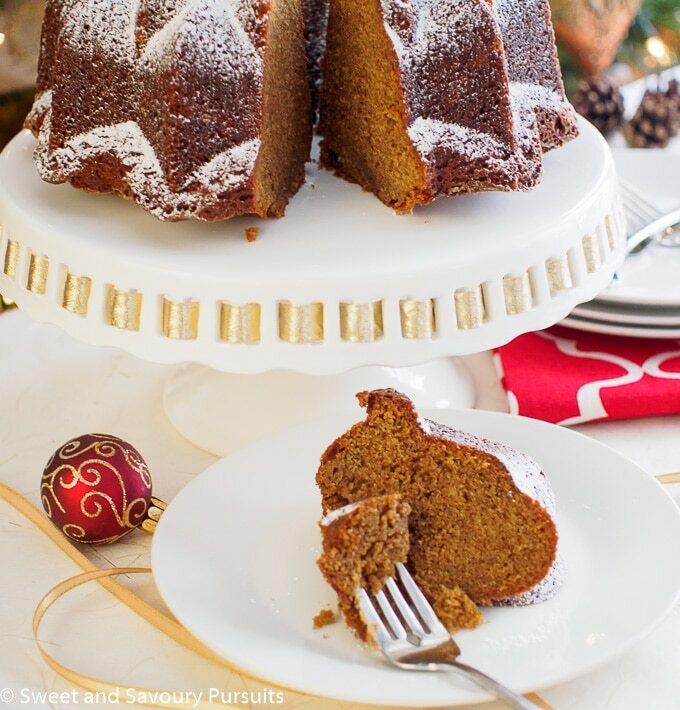 This Espresso Gingerbread Bundt Cake smells just like Christmas. 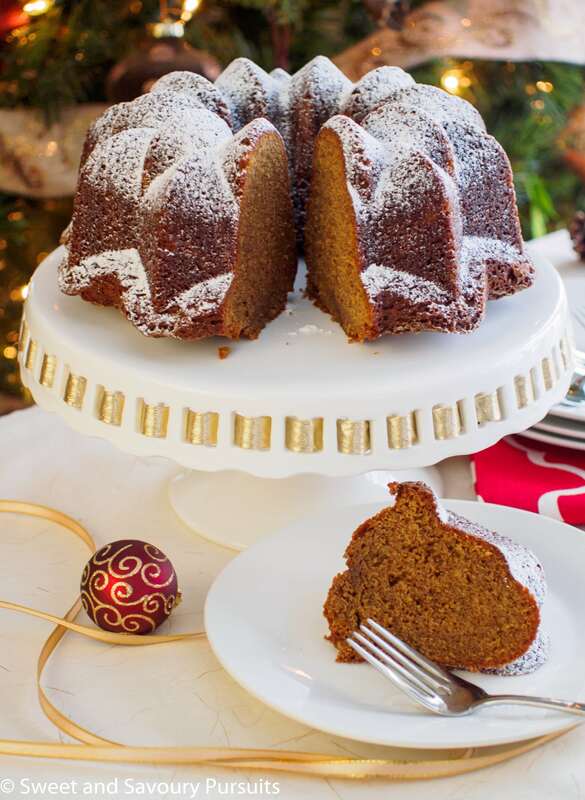 Spiced with cinnamon, ginger, cloves and nutmeg, it’s the perfect cake for the holidays. The holidays are fast approaching and one of my favourite recipes that I crave every year during the holiday season is this Espresso Gingerbread Bundt Cake. Made with molasses and fragrant spices such as cinnamon, ginger, cloves and nutmeg, it’s a classic gingerbread cake with a twist. The espresso added to this cake gives it even greater depth of flavour and reminds me of a gingerbread flavoured coffee drink. The recipe for this Espresso Gingerbread Bundt Cake will make one large bundt cake or 4 miniature loaves. I have a special bundt pan that I always use to bake this cake in, in fact, I think it’s the only cake that I bake in this pan. The pan has indentations in it, so when the cake is baked and turned out it comes out of the pan with beautiful peaks and when you sift powdered sugar onto the cake it looks like snowy mountains, perfect for Christmas time. Of course, you need not go out and buy a new pan, any large bundt pan will work for this recipe. This is a simple and moist cake with great flavour. It’s beautiful on it’s own or with a simple dusting of powdered sugar. If you really wanted to dress it up you could add an espresso glaze to it. Looking for more holiday treats? Take a look at this recipe for Pistachio and Cranberry Biscotti or these Chewy Ginger Cookies. And if you need more inspiration for your holiday menu take a look at my collection of holiday recipes. 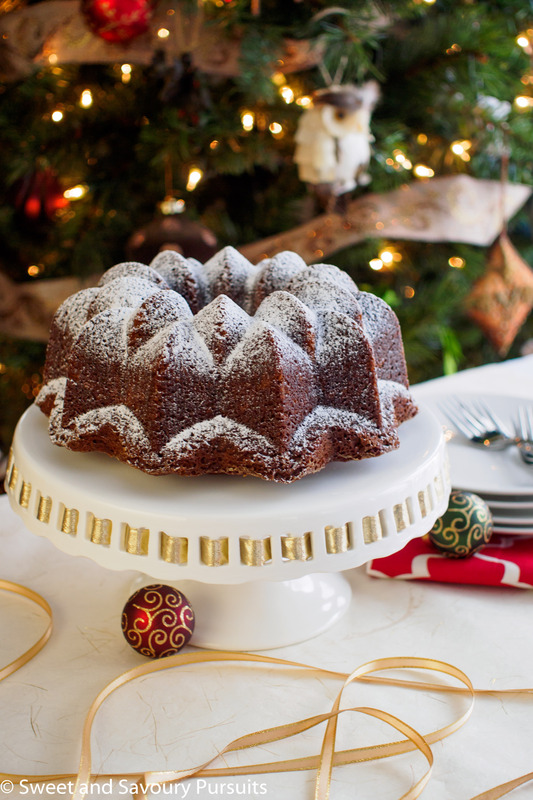 This Espresso Gingerbread Bundt Cake smells just like Christmas. Spiced with cinnamon, ginger, cloves and nutmeg, it's the perfect cake for the holidays. Grease and flour a large bundt pan (or 4 mini loaf pans if that is what you are using). In a liquid measuring cup, stir the warm brewed coffee with the molasses. Set aside. In a medium bowl, sift the flour with the baking powder, salt, baking soda, espresso powder, ginger, cinnamon, nutmeg, and cloves. Whisk the spices with flour to get the flour mixture well blended. Set aside. In the bowl of your stand mixer fitted with the paddle attachment, beat the butter on medium speed until smooth, about 1-2 minute. Add the brown sugar and beat for about 2-3 minutes, until fluffy. Add the eggs and egg yolks, one at a time, beating after each addition so the egg is well mixed in. With the mixer on low, alternately add the flour and coffee mixtures, beginning and ending with the flour. Beat the mixture on medium speed until the batter is smooth, stopping a couple of times to scrape the bowl. Transfer the batter into the prepared bundt (or mini loaves) pan and spread the top with a rubber spatula. Bake for approximately 38 to 40 minutes (approximately 30 minutes for mini loaves) or until a toothpick comes out clean. Let the cake cool in pan on a rack for 10 minutes and then turn out onto the wire rack to cool completely. If desired, when the cake is completely cooled you can sift some powdered sugar onto the top for a nice snowy effect. Such a perfect, delicious cake! All the flavours I love! I saw your site on the new member list of Food Bloggers of Canada. Hello, that’s great, yes I just joined. Thank you so much! Thank you, I wish I could take credit for the coffee idea but it’s part of the original recipe from Fine Cooking. Just delicious really! Woooow! I seriously need to give this a try! Like soon! Thanks so much for sharing! Merry Christmas! Thanks Kloe! Thank you for stopping by. Merry Christmas to you! What a delicious bundt cake.. the flavours are so perfect for this time of year too. Wish I had a thick slice to devour right now! This cake must be delicious… espresso, ginger and cinnamon… they sound amazing together! Oh heavens this is amazing. Thank you! The bundt pan really makes a beautiful cake. And the coffee is a great addition. Thank you Nancy, it really is delicious! Thanks, though I can’t take credit for adding the espresso, it’s from Fine Cooking! Thanks Mila! It really is a perfect cake for this time of the year!